"The Yellow Wallpaper" site at www.scribblingwomen.org includes an audio drama version of the story, biographical information, a short critical essay, and other materials. Bibliography of primary works at the Celebration of Women Writers site. 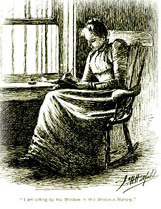 The Charlotte Perkins Gilman Society includes calls for papers, links, and its newsletter. Brief biography and bibliography at the Charlotte Perkins Gilman conference site. A student site with annotated bibliography by Dr. Jim Wohlpart's students at Florida Gulf Coast University (1998). Image courtesy of the Celebration of Women Writers site. Thanks to Rebecca Wall for recent corrections to links on this page.